Every day Russell Thorn, physical plant supervisor, comes to work and checks his emails and School Dude, a campus wide program that checks to see if there are any requests for maintenance around Malone. Then he gets right down to business. Thorn, who was raised on a farm, said he always wanted to be a farmer before he came to work at Malone. His experience as a farmer grew into a love for landscaping. “I’ve grown to love the outdoors…I really enjoy planting and watching things grow,” Thorn said. A good tan and a lot of vitamin D are just a few of the benefits to working outdoors, Thorn said. 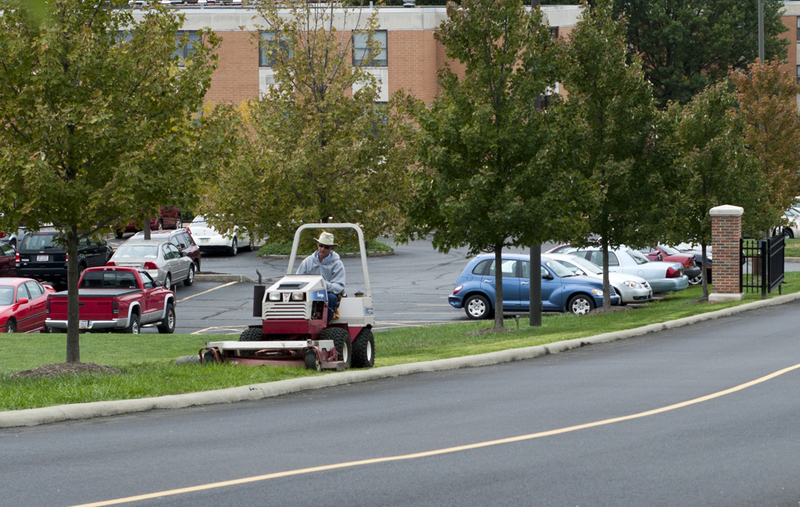 Thorn’s staff holds the responsibility of keeping all 100 acres of campus clean and maintained which includes 40-50 hours of mowing a week, weeding, raking leaves and collecting recycling. His staff is also responsible for setting up for chapel and decorating campus during the holidays. [pullquote]Fun Fact: There are over 2 miles of sidewalk on Malone’s campus. [/pullquote] During the winter, Thorn and his staff’s priority is snow clean-up. He said it usually takes his four to six student workers, along with Thorn and his three full-time employees, to shovel snow within a couple hours. Student workers are a challenge for Thorn, he said, as many students are not interested. He currently has five student workers, but needs at least eight. Freshman philosophy major Austin Fraley has been a student worker for the physical plant since summer. “It’s not the easiest job, but we have a lot of fun,” Fraley said. Fraley’s responsibilities include mowing, landscaping, mulching, replanting trees, and recycling. Despite the manual labor and early mornings, he said he enjoys the job. Thorn said that most students notice what hasn’t been done rather than what is being done. When walking around campus, remember the physical plant workers the next time you see landscaping or clear sidewalks in the winter. Help make their job easier by respecting Malone property and doing your part to help keep Malone clean and looking its best. Sarah Bosler is a contributing writer for The Aviso AVW.